← 2. Who are we? The Absolute Truth… What is the Absolute Truth? Actually the Absolute Truth has three divisions or aspects. In the Vedas we learn that there is a Supreme Person, just like you and I are persons, we are all people, we call ourselves, “Look at all the people.” In the Vedas we learn that there is a Supreme Person and we all came from the Supreme Person. The Supreme Person is known as the Supreme Personality of Godhead. In common everyday language in the world this is known as God. The word God is somewhat disliked by many people, “Oh, this is religion. Are you going to talk about God? I thought this was yoga!” Yoga is the perfect religion. There is only one religion and that is union with God. This Supreme Person is known as Bhagavan. Bhagavan is the Supreme Person. And there is only one Supreme Person. It’s not two or three Gods. One. Not ‘my God’ or ‘your God’. In yoga we don’t learn that. We learn about the Supreme Person. The Supreme Lord is unlimited. He created everything that exists including ourselves. And He has potencies that are inconceivable. In other words, He can do anything that He wants. His will is Supreme. So one of the things that He does: He expands Himself into many other forms. So there is the original form and then many expansions. The different expansions perform different functions. Of course, Bhagavan resides in the spiritual world. And material world is one of His creations. We, the spirit souls, are originally in the spiritual world but now we have come into the material world. In the spiritual world we are in union with God. This is the life in the spiritual world. But now we have come into the material world and become separated, separated in consciousness; we are consciously separated. But the Supreme Lord never leaves us. So when we come into the material world, the Lord accompanies us, always. And one of these expansions that I mentioned is known as the Paramatma. The Paramatma is known as the Lord in the heart, also known as the Super Soul, also known as Chaita Guru or the Lord (or the Guru) within. In this material body, which is not ourself, we reside. We are the life force, we have just talked about this. Here we are, the little spiritual personality inside the body. But also residing within the body is the Paramatma, our constant companion. No matter where we go, He is always with us. But we are not aware of that, we are not conscious of that, we have become separated. So He is very close but very far away. And then there is another aspect of the Absolute Truth. This is known as Brahman. The Brahman is the impersonal aspect of the Absolute. As we mentioned, there is a spiritual world where Bhagavan resides. And the spiritual sky is the effulgence that comes from Bhagavan. The spiritual sky is illuminated by the effulgence coming from Bhagavan. This is known as the Brahman effulgence, also known as the Brahmajyoti. ‘Jyoti’ means ‘light’, ‘Brahman’ means ‘spiritual’. The spiritual light. Just like in our universe, there is the sun and from the sun comes a big effulgence, it illuminates our sky. So the effulgence of the sun is the formless or impersonal aspect of the sun globe. Also we, the little spirit souls, have an effulgence. It is called an aura. Maybe some of you have heard of an aura. We give off a little light, too. And now people have developed the way to photograph this aura, “Take a picture and see how much effulgence you’re giving off.” People get very proud if they have big aura. You have your picture and you take it, “Oh, look at this!” But if your aura is little, not much light, you don’t show anybody your picture, keep it to yourself. But the point is the Supreme Lord has this huge aura known as the Brahmajyoti. So these are the three aspects of the Absolute Truth. 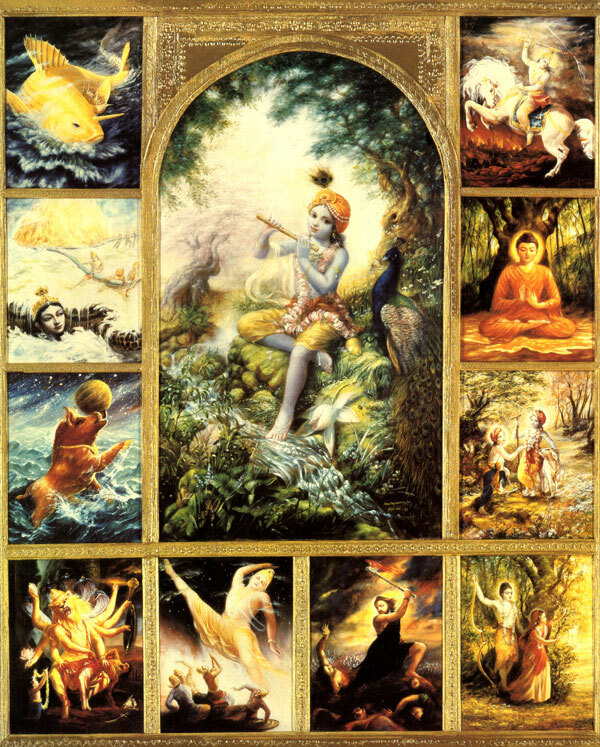 Bhagavan, Paramatma and Brahman. And the yoga paths are designed to take us, the individual souls, back to one of these three destinations. They are all spiritual, they are all transcendental.